What’s it like to stay in the Women’s Shelter? 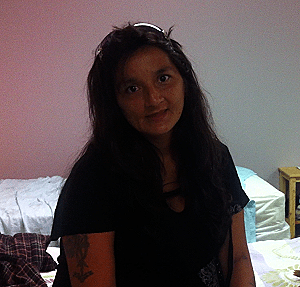 Donna shares what it is like to stay in The Lighthouse’s Women’s Emergency Shelter. This is the second time Donna has stayed at the Lighthouse since I started working here one year ago. The first time she stayed in the shelter she was often under the influence which resulted in her not being able to stay with us. Donna has since cleaned up and is moving on to the next steps in her life. She is a very caring mother and new grandmother and is trying to be a better role model. Donna states that she wishes there was a limited for how many women can stay in the shelter. There is a limit – 25 women – but this August is the first time we have gotten close to being that full, so it feels very different than it has in the past. It is a dormitory-style room, so that’s a lot of different personalities sleeping in a room together. The Lighthouse is actually one of three women’s shelters in the city, including the YWCA and Mumford House. I know they are very full as well. Why are the shelters so full these days? Before I started working here I would have assumed that emergency shelter’s empty out in summer time. That has not been the case this summer at all, as we have had higher numbers since June. People need to stay here for many different reasons, so as of yet we have no way to pinpoint exactly why we have a higher volume of clients. I know the vacancy rate is very low in Saskatoon and this may account for some of the pressure of shelters. Jordon, our General Manager, wrote more about this in a previous post. Please consider donating to a community organization that helps women in need in Saskatoon. We always appreciate shampoo, conditioner, soap, feminine hygiene products, new underwear and socks. If you would like to volunteer at the Lighthouse, you can fill out an application here.